West Country bakery, Tamar Foods bake own label savoury pies, slices and snack foods for leading supermarket chains. Tamar is part of the Samworth Brothers group which, amongst others, owns Ginsters and it is Ginsters that distributes the Tamar product to retailers throughout the UK. In 2012 Tamar won a prestigious contract with Marks and Spencer to produce a range of M&S savoury pies. A stipulation of the contract was that, provided the trial period was successfully completed, the Tamar conveyor system would need to be able to handle M&S’s green totes – something Tamar’s existing system couldn’t do. Tamar’s existing conveyor solution was installed to take products from the packing hall to the Ginsters dispatch hall, via a 160m long tunnel joining the two buildings together. The route the conveyor took was somewhat tortuous, twisting and turning its way along, up through the roof and then back down to the dispatch carousel. The tunnel in particular, was extremely confined both in height and width. Steve Towsey, Tamar’s project engineer, takes up the story, “The existing conveyor was 12 years old; it was extremely noisy, very unreliable, difficult to maintain and, of course, couldn’t handle the M&S totes. So, to meet the terms of the M&S contract we had to invest in a new conveyor solution. “Naturally we did our due diligence in our search for a supplier to work with on the project. We had worked with Axiom before, however, when they supplied a carousel in the dispatch hall and so they were included in the short list. “Our final decision to partner with Axiom was made for several reasons: firstly, their presentation was very impressive and gave us the confidence they could do the job. Secondly, their track record was notable with big projects for the likes of Ford in Germany and Lakeland Plastics here in the UK. Finally, their solution was not only well thought out, but also offered excellent value for money. The conveyor system is fed from three packing stations – two manual systems and one fully automated packing machine. The packers can pack up to 77 totes per minute which the system then has to merge and convey from the three packing areas. To supply the packers with a constant feed of empty totes, Axiom designed an overhead tote delivery conveyor which transports totes from a holding area to the packing face. The packers then simply select the next empty tote from above their station and pack into it without having to leave their station. A combination of packed totes and cartons join together over a series of merge conveyors onto one conveyor that twists and turns its way up a series of inclined belt conveyors into the roof void. The conveyor passes through the long tunnel where a series of roller conveyors queue product for delivery to the dispatch hall. Steve Towsey again, “There were challenges at almost every stage of the route. Once out of the packing hall and through the confines of the tunnel, we had to route the conveyor down a relatively steep decline to get it onto the dispatch carousel. Previously, a belt conveyor had done this job, but you can’t run an accumulation system with a belt conveyor so we had to use rollers. “The problem with steel rollers on a steep decline is that product slides down them. This would have meant the totes and cartons would have just piled into one another damaging product and causing blockages. “To avoid this, the Axiom engineers came up with the idea of using steel rollers with a rubberised coating. This hadn’t been done before, but I have to say it works a treat and has run faultlessly from the off. The installation process for the system was extremely complicated. The old conveyor had to be removed and the new system installed in no more than three weeks. Access to the tunnel was limited to a small door through the dispatch hall and access to the packing hall was only allowed on Sundays, so it was a real challenge. “The Axiom team had to work in very confined areas in temperatures ranging from a chilly three or four degrees in the dispatch hall to extreme heat in the tunnel and roof void,” continues Towsey. “They did a fantastic job, particularly in the tunnel and roof where the access and space was so limited. Despite all this, the installation started on time and was completed on time with the system going live on the agreed date. “Axiom spent a few days on site making a couple of tweaks and then they left. Apart from a site visit for a service/inspection, they haven't had to come back since, it has worked perfectly. 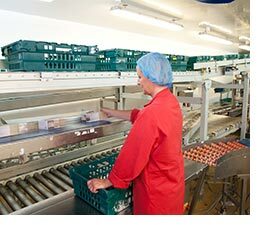 “Although the system operates 24/7, it has been designed to ’go to sleep’ when there are no products on the conveyors. This means that as well as getting savings from low maintenance requirements or downtime, the new system delivers excellent energy savings. “The workforce love it too because it is much quieter than the old system and much easier for them to operate. The company loves it because it is totally reliable; it gives us great energy savings in excess of £14,000 a year and the accumulation feature means hold-ups anywhere along the line do not result in the whole line shutting down, so it’s a more productive system. “Axiom has been brilliant from day one. Everything from the design down to testing and commissioning has been done in a very professional manner and the attention to detail is outstanding. The 24hr support package and their ability to remotely access the system through their intranet gives us real peace of mind. “The new conveyor system has more than lived up to our expectations. It does exactly what we wanted it to do; it handles the M&S totes and our own variety of cartons with ease. It deals with everything we throw at it and I am sure that we will work with Axiom on future projects,” concludes Towsey.